Beautifully decorated family second home/townhome on West Creekside Drive, secluded deck over looks North Fork of Ten Mile Creek, sit on deck and listen to the babbling brook, in comfy Smith Hawkin Adirondack chairs. Short walk to Main Street Frisco where you'll find fun and tasty, restaurants, coffee shops, gifts, bakeries, liquor stores, market and historic park, with free fun activites and events. Enjoy spa treatments too! Close to all Summit County Ski Areas - 10 min. by car to Copper Mtn., 20 min. to Keystone and Breckenridge, 30 min. to Vail, Loveland or A-Basin. Or, take the free Summit Stage Shuttle to Breckenridge, Keystone, Copper Mountain or A-Basin, 1 block away on main street. Enjoy better pricing and fewer crowds while soaking up Frisco's historic local charm, and still be only minutes away from the slopes! For the outdoorsman, you'll find easy accessibility to skiing, cross country skiing, show shoeing, snow mobiling, hiking, biking, fishing, boating, frisbee/disc golf, mountain biking, and mountain climbing in the majestic Colorado Rockies! Lake Dillon also has The Frisco Marina and a variety of water sports activities and rentals. Frisco Nordic Center and Frisco Peninsula Park less than 5 minutes away. Our remodeled townhome features 2 bedrooms (Master with Queen & Second Bedroom with 2 Twins, 2 bathrooms (1 in Master Bedroom & 1 in Hall between bedrooms) and a full size loft with a Queen Canopy Bed and Daybed. Enjoy looking at the North Fork of Ten Mile Creek, and Indian Chief Mountain. Kitchen/front balcony has beautiful views of Buffalo Mountain and is appointed with Calphalon pans, beautiful dinnerware and glassware, is fully stocked with paper products, spices, condiments, and Kitchenaid small appliances. All rooms have been newly painted in Ralph Lauren colors, new, deep lush berber carpet and hard wood floors, and furnished with Flat Rock hand made mountain furniture. Fun art work from well known artist Stephen Huneck throughout. Sit on large comfortable Lane sectional in front of a roaring natural wood fireplace and enjoy reading art/photography books, novels, and current home decorating and outdoor magazines or select and play a variety of board and novelty games, and or watch your favorite TV show or a free movie. The master bedroom features a comfy queen bed with adjacent private bath, second bedroom w/2 twin beds, fun decor, and flat screen TV. The large loft bedroom has a queen canopy bed with matching day bed. All beds are Simmons mattresses. The Calico Corners custom-made bedding and drapes in all rooms and Ralph Lauren sheets and towels. Enjoy the private relaxing Hot Tub in the sunroom while looking at Mount Royal, great after a day on the slopes! Our beautifully decorated townhome is a quiet, private haven to rejuvenate in-we do! 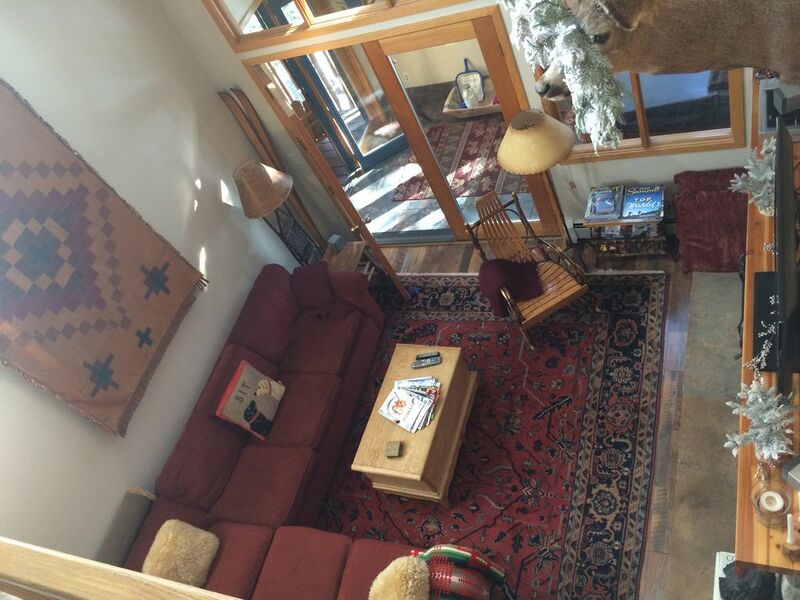 The owners live in Denver, Colorado and maintain beautifully furnished, comfortable second home in Frisco, Colorado. Come stay at our place and you can be kicking back and having fun in the wonderful Colorado mountains, just like the owner in this slopeside picture from last ski season!! Get a tan, have a beer, take a hot tub, relax and rejuvenate yourself!! Frisco is a great little town, there are fun activities all year long and numerous skiing options, it is truly a mountain town. Our townhome is beautifully decorated and has all the conviences of home with shampoo, hair dryers, nice fuzzy towels, all cotton Ralph Lauren sheets, all paper products. Natural wood for a roaring fire. You can walk right in and it's ready to enjoy with everything you need! Relaxing, quiet, comfortable stay. We call the place the tree house, because all you see out the windows of this 2nd story unit are Aspen and Pine trees. The back of the unit sits on the north fork of Ten Mile Creek, and you can enjoy the relaxing sound of running water throughout the spring, summer and fall, while you sit in on the back porch or in the master bedroom. Come see for yourself, and rejuvenate and re-energize your batteries at this wonderful getaway!! Ceiling Fans in all rooms its wonderfully cool in the mtns in the summer! This place had everything we wanted. Well equipped kitchen. Warm, quiet, and comfortable. Nicely furnished and decorated. Close to downtown Frisco. We really enjoyed our stay. Great property, great central location. Thumbs up! Condo was very well appointed and comfortable for our family of four. Kitchen was well equipped for preparing meals, linens and towels were excellent quality and there was plenty of hot water for showers after a great ski day on the slopes. The property was as represented on the VRBO site, no surprises or disappointments. Enjoyed our two week stay during the snowiest March in recent history! I spent a wonderful 4 nights here with my sister and a friend who came up to ski with me for 4 days. The "inside the house" hot tub was perfect for the two of us after long days of skiing. The couch and the beds were very comfortable and the entire unit has been thoughtfully decorated to invite rest and relaxation. We enjoyed the wood burning fireplace,especially as we visited during a very cold week . A wonderful ski/snowboard week in Frisco! Our family had a wonderful time at the "Treehouse!" Everything was as pictured and described; it was perfect! Colleen answered all of our inquiries quickly and sent us a package that thoroughly outlined what to expect upon our arrival and throughout our visit complete with her recommendations for top notch local sites, shopping and dining; she made us feel very welcome. Her home has thoughtful amenities that helped us to have a seamless stay. The well stocked kitchen includes plenty of cookware, glasses, cutlery and dinnerware. Conveniences like spices, aluminum foil, Ziploc bags and coffee filters meant we did not have to bring or purchase these items. Our family tries to travel light and it was great to have an in-home washer/dryer so we had fresh clothes every day and were able to return home without a pile of dirty laundry. It was nice to have extra lotion and humidifiers already in place to use in the dry, alpine Frisco environment. And, of course, the private indoor hot tub was a bonus we were able to use to relax our sore muscles after skiing/snowboarding on the slopes. Thank you so much, Colleen! You helped our family to create fantastic memories we will always cherish! We hope to return soon! This place feels like home! Most rentals can be stark and minimal. But they have everything you need. It's well decorated and feels like a cozy cabin. We enjoyed the fireplace and of course the two person hot tub. We always looked forward to coming home from a long day and relaxing. The furniture and beds are super comfy and very spacious. We would definitley stay here again. HOLIDAYS: All holidays may require "additional nights". There will be a one time charge of $150.00 per reservation for housekeeping fees. Reservations are confirmed with payment, security deposit returned upon receipt of key back to owners and maids report. Discounts and weekly rates at owner discretion, not available during December or March. No more that 6 people are allowed in the rental unit for overnight stays.